This is a channel for professionals who want to create great products. The presentations within are about optimizing your processes, getting the right feedback, making great decisions and communicating your product's value internally and externally. 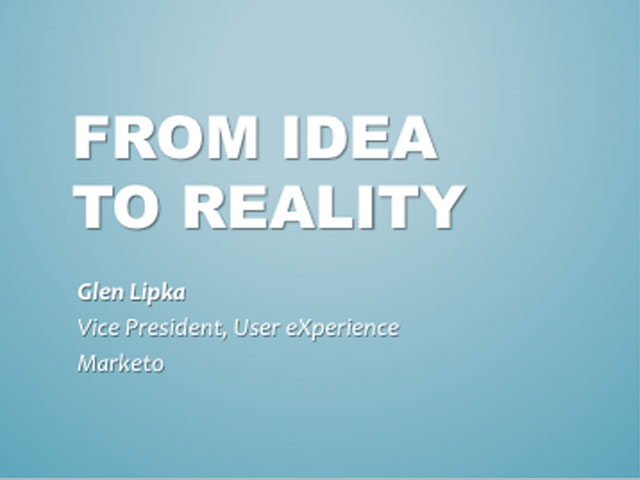 About Glen Lipka: Glen Lipka is the Vice President of User Experience at Marketo where he was the first non-founder employee that ran product management and UX for several years of the company’s development. Prior to Marketo, Glen was a Senior UI Designer at Intuit, Director of User Experience at Adchemy and started his career running a thirty-person web development company in NYC during the Internet bubble. Glen has been a pioneer in websites and web applications for over 15 years, pushing the envelope in interactivity on public facing websites to Rich Internet Applications (RIA) for businesses. He speaks frequently on all aspects of building great products on the web, including NYU Stern School of Business and Stanford University.